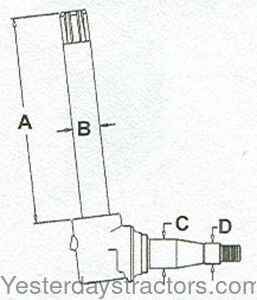 Description: Spindle, Heavy Duty. Dimensions A-15.125 inch B-1.750 inch C-1.795 inch D-1.312 inch For tractor models 2510, 2520, 3010, 3020, 4000, 4010, 4020, 4320 tractors. All with Heavy Duty Spindle. The wheel bearing kit used on this spindle is kit part number WBKJD7.